Dec. 12, 1912 Eugenics Record Office. Board of Directors. 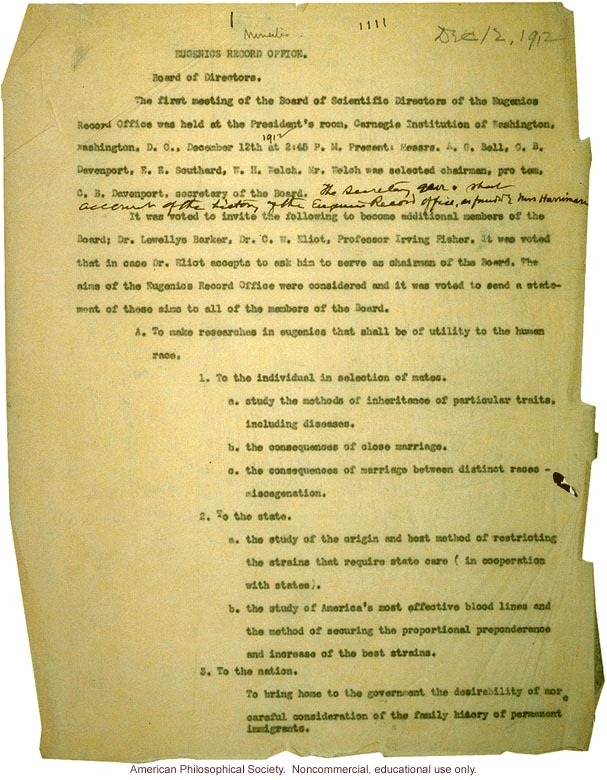 The first meeting of the Board of Scientific Directors of the Eugenics Record Office was held at the President's room, Carnegie Institution of Washington, Washington, D.C., December 12th 1912 at 2:45 P.M. Present: Messrs. A.G. Bell, C.B. Davenport, E.E. Southard, W.H. Welch. Dr. Welch was selected chairman, pro tem, C.B. Davenport, secretary of the Board. The Secretary gave a short account of the history of the Eugenics Record Office, as founded by Mrs. Harriman. It was voted to invite the following to become additional members of the Board: Dr. Lewellyn Barker, Dr. C.W. Eliot, Professor Irving Fisher. It was voted that in case Dr. Eliot accepts to ask him to serve as chairman of the Board. The aims of the Eugenics Record Office were considered and it was voted to send a statement of those aims to all members of the Board. A. To make researches in Eugenics that shall be of utility to the human race, 1. To the individual in selection of mates. a. study the methods of inheritance of particular traits, including diseases. b. The consequence of close marriage. c. The consequences of marriage between distinct races - miscegenation. 2. To the state. a. the study of the origin and best method of restricting the strains that require state care (in cooperation with states). b. The study of America's most effective blood lines and the method of securing the proportional preponderance and increase of the best strains. 3. To the nation. To bring home to the government the desirability of more careful consideration of the family history of permanent immigrants.